Before Jaap started working at Quantib as an R&D engineer, he studied and worked at different places all related to biomedical imaging. 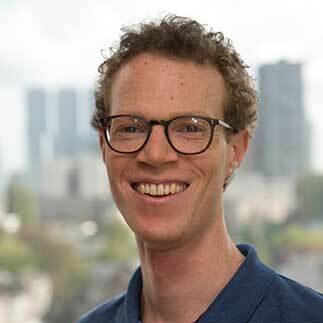 After his first year in medical school, Jaap switched to Biomedical Engineering at TU Eindhoven and obtained a Master’s degree in Biomedical Image Analysis. During his studies he followed an internship at the Computer Vision Laboratory at ETH Zurich. His Master's thesis was written at the Diagnostic Image Analysis Group, Radboudumc Nijmegen. Afterwards he moved to Belgium where he worked at the Medical Imaging Research Center, UZ / KU Leuven. However, after two years in Belgium he decided to move back to the Netherlands, where he joined Quantib, excited about translating research algorithms into practical clinical software. Interesting fact about Jaap: his first publication was on using computer vision techniques to automatically detect Xanthomonas Hyacinthi; an infectious disease in Hyacinth bulbs. This work was done in a collaboration with Wageningen university. Next to running machine learning experiments, Jaap likes to play tennis and classical guitar.